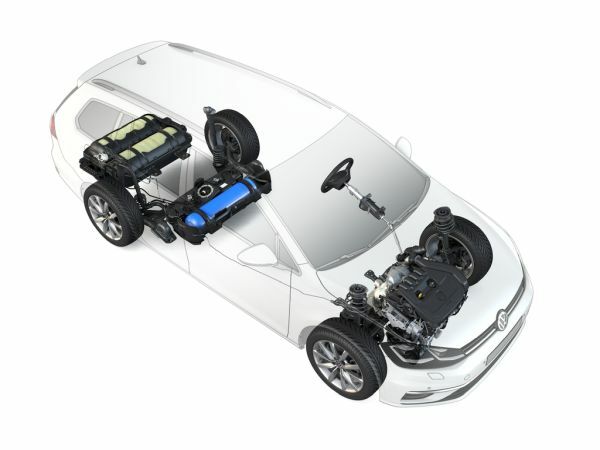 Volkswagen’s natural gas strategy continues to gain ground: only recently available to order, the Polo TGI and Golf TGI are now joined by the Golf Variant TGI1) with eco-friendly natural gas engine. The new model now boasts three natural gas tanks – instead of just two as before – once again increasing the already long range of the CNG drives. And there’s no need to compromise on space either to accommodate the three tanks on-board, as the natural gas tanks are integrated as a space-saving underfloor solution. At the same time, the additional tank increases the range in natural gas mode by up to 80 kilometres compared to its predecessor. You’ll now also reach your destination faster, as the bonnet conceals an overhauled, powerful 1.5-litre four-cylinder engine with 96 kW (130 hp). This engine is primarily powered with compressed natural gas (CNG) – the petrol tank is smaller as a result and thus only serves as a backup. Thanks to the TGI Miller combustion process and the variable turbine geometry (VTG) of the turbocharger, the Golf Variant TGI’s 1.5-litre four-cylinder petrol engine is even more efficient and responsive than its predecessor. It delivers 96 kW (130 PS) and boasts a torque of 200 newton metres. With the petrol tank reduced in size to 9 litres (for a Golf Variant TGI, that corresponds to a range of approximately 200 kilometres) and now serving merely as a backup, this is referred to as a quasi-monovalent drive concept. In other words, the range with natural gas alone has increased by around 80 kilometres, enabling routes of up to 440 kilometres (based on WLTP) with natural gas alone. The three natural gas tanks have a combined volume of 115 litres, which corresponds to a total weight of 18.3 kilograms. The tanks are made from carbon fibre-reinforced plastic (CFRP) or from metal. The CO2 emissions of a natural gas vehicle are much lower than those of a comparable vehicle with a conventional engine, as combustion of compressed natural gas (CNG) releases around 25 per cent less CO2 than combustion of petrol. The reason for this is the low percentage of carbon in natural gas. Thanks in part to the innovative lambda split process, natural gas also burns extremely cleanly: the exhaust contains much less carbon monoxide and nitrogen oxide (NOX), resulting in minimal soot and fine dust. If you fill up your vehicle with biomethane or e-gas, you can minimise your emissions even further, as biomethane is derived from residual plant matter, and e-gas from excess green energy (power to gas). Both can be added to fuels or are available as pure biofuels. Driving with natural gas is also comparably cheaper in just about all countries. In Germany, natural gas is around 20 per cent cheaper than diesel and as much as 40 per cent cheaper than petrol. And that’s despite the fact that natural gas contains much more energy. For comparison: one kilogram of CNG corresponds to around 1.3 litres of diesel or 1.5 litres of petrol. In Germany, the number of natural gas vehicles is expected to reach one million by 2025, with some 100,000 natural gas vehicles already registered. For this to work, the product portfolio needs to be expanded and the network of filling stations in Europe increased to 2,000 – also by 2025. In addition to the eco up! and TGI models of the Polo, Golf, Golf Variant the Volkswagen Group also already offers an extensive range of 14 CNG vehicles.